Oil is in retreat today after weeks of gains. A look at the daily chart over the past six months shows a bust-and-boom trade. 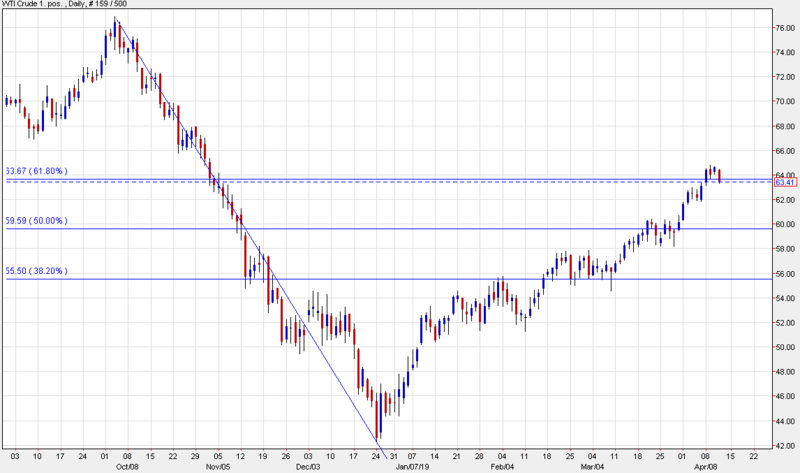 The key level for me is $63.67, which is the 61.8% retracement of the Q4 plunge. We broke it late last week in fairly emphatic fashion but crude has been unable to press the advantage. Part of what makes me negative about the fall back below that level is that Brent was never able to rise above the 61.8% level on its chart, falling more than $1 short. Naturally, they need to break out or breakdown together. For now, I see a period of consolidating. Crude got ahead of itself in the past two weeks but there is a seasonal tailwind and the fundamentals are solid. The big event coming up is the US announcement on Iran sanctions in May. There are signs they want to cut exports further.